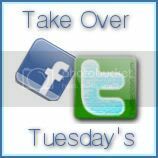 Welcome to Take Over Tuesday, a Facebook,Twitter, and Google+ hop. Each week we will have either hop on Twitter, Facebook, G+. Google+ link in the linky and follow your hostesses. We will follow you back. Follow as many people as you like and leave a comment on their page to let them know you are a fan. Remember, following back is appreciated! thanks for the linky. Is there no actual way to post on someone's wall on google+? Some people I comment on a post they have made but others I cant comment on at all. Still don't like google+ all that much.